Higher temperatures accelerate the transmission of West Nile virus by mosquitoes, researchers found. Photo courtesy of L. Kramer. Higher temperatures helped a new strain of West Nile virus invade and spread across North America, according to a study published in the June 27 issue of the journal PLoS Pathogens. "The study shows that the warmer the temperature, the greater the advantage of the new strain. It also indicates that increases in temperatures due to global climate change would have major effects on transmission of the virus," said A. Marm Kilpatrick, first author of the paper and a senior research scientist for the Consortium for Conservation Medicine. Kilpatrick, now an assistant professor of ecology and evolutionary biology at the University of California, Santa Cruz, joined with Laura Kramer and others at the New York State Department of Health's Wadsworth Center to conduct the study, which examined the effects of different temperatures on the transmission of two strains of West Nile virus. The first occurrence of West Nile virus in North America was in New York City in 1999, when it caused a die-off of crows and other birds and 62 reported cases of human infections, including 7 deaths. In the two years after the introduction of the virus, the rate of transmission was relatively low. As it spread along the Atlantic seaboard, there were only 21 reported human cases in 2000 and 66 in 2001. In 2002, however, a new strain of the virus emerged and rapidly spread throughout North America, completely displacing the old strain by 2005. Coincident with the spread of this new strain were two of the largest epidemics of West Nile virus recorded to date in North America, with 4,582 cases reported in 2002, 11,356 cases in 2003, and more than 270 deaths in both years. Since then, the number of reported cases per year has ranged from 2,500 to nearly 6,000, with more than 100 deaths each year. Kilpatrick and Kramer set out to determine how the new strain of West Nile virus had displaced the first strain, and what effect temperature had on transmission by mosquitoes. They used laboratory tests to determine how soon mosquitoes are capable of transmitting the virus after feeding on infected blood. The results showed that the new strain is more efficiently transmitted than the older strain, and the advantage of the new strain increases with higher temperatures. For both strains, increases in temperature greatly accelerated transmission by increasing the efficiency of viral replication in the mosquitoes. As a result, temperature increases of just a few degrees due to global warming could sharply accelerate transmission of the virus and possibly lead to more severe epidemics of West Nile virus in some cooler regions, Kilpatrick said. The researchers used the results to develop a model to predict the impact of increasing temperatures on West Nile virus transmission by mosquitoes. "A previous study in our lab demonstrated that the new strain of the virus was more efficient at replicating in mosquitoes, which may have increased the intensity of epidemics in the field," Kramer said. "We wanted to examine whether temperature might have played a role in the invasion of the new strain, and whether its success may have been related to increasing temperatures." 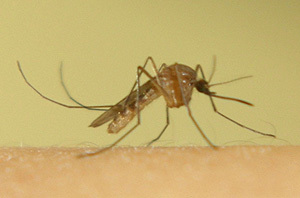 Kramer's lab performed a series of studies that involved infecting one group of mosquitoes with the introduced 1999 strain of West Nile virus and siblings with the recently evolved strain. After holding the mosquitoes at different temperatures and for different lengths of time, researchers determined what fraction could transmit the virus. They found that the new strain was more efficient than the introduced strain at nearly all temperatures and time points after infection. Kilpatrick, who analyzed the data and developed models to predict the impact of temperature on transmission, said the results provide a striking example of how climate and evolution can interact to increase the transmission of this virus. "These results also suggest that relatively small increases in temperature can have large impacts, due to the nonlinear acceleration of transmission with temperature," he said. "This study shows how direct the impacts of climate change could be for us all," said Peter Daszak, executive director of the Consortium for Conservation Medicine, based at Wildlife Trust in New York. "It isn't just about a rise in sea level or the melting of a glacier in Alaska--it's about our health and our welfare." In addition to Kilpatrick and Kramer, the coauthors of the paper include Mark Meola and Robin Moudy of the Wadsworth Center, New York State Department of Health. The study was funded by the National Institute of Allergy and Infectious Disease, the National Science Foundation, the Centers for Disease Control and Prevention, and the National Institutes of Health. Note to reporters: You may contact Kilpatrick at (845) 596-7474 or marm@biology.ucsc.edu. To request an interview with Laura Kramer, contact the N.Y. Department of Health's Public Affairs Group at (518) 474-7354.